Hello all you beautiful people! 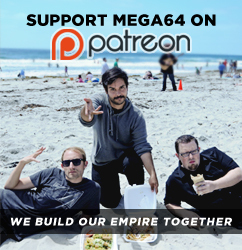 I am here with the podcast that is the first step in making Mega64 the greatest thing on the Internet! In this episode: We announce our Patreon! This was hour 6 of our Patreon launch extravaganza! We talk about all the fun we had during the stream and talk about our new BTS videos that we just released!Plus, for a added bonus Rocco isn't wearing pants for the entire episode! How lucky are you!!!! Click here for the audio!!!! That's all for now! Thank you to everyone who donated to us, we are completely humbled by how rad all of you guys are. WE WILL SEE YOU AT GAMEDAYS!!! !